Cerebral Metalhead: R.I.P. National Sunday Law. Much respect. R.I.P. National Sunday Law. Much respect. 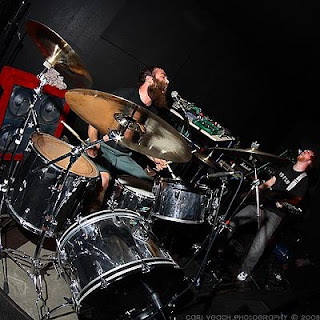 After playing over 50 shows with some of our favorite bands (Intronaut, Mouth of the Architect, Irepress, Behold...The Arctopus, Dysrhythmia, Exhausted Prayer, Solar Wimp, Hurt Model, Fight Amp and so many more), we are taking a break from National Sunday Law. Due to a dire financial situation and ongoing employment issues, Darin will be moving back to his home state of Maryland in late June. Therefore, the band will be on an indefinite hiatus after two more shows. This is a major bummer. 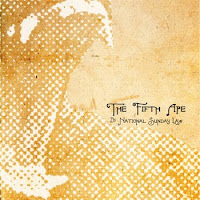 National Sunday Law were one of my favorite L.A. bands of any stripe. They filled a pretty vital function out here -- heavy enough for the metal crowd, arty enough for the noiseniks, tricksy enough for the prog-heads, NSL could play on almost any bill. And with just two dudes covering a vast sonic spectrum, their shows were always a minor spectacle. Both Darin and drummer Derek Donley were faithful supporters of the scene on both sides of the band/audience divide. 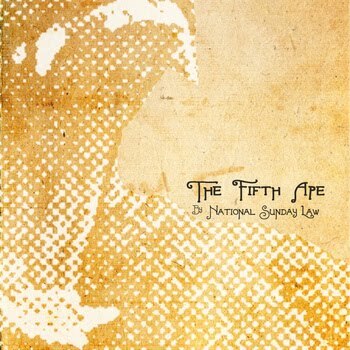 NSL's disbandment is especially disappointing given that they just released a killer new EP, The Fifth Ape, which you can download here for free. The EP showcases the band's balance of meditative mood and eye-bugging heaviness way better than their debut album, La Storia di Cannibali (reviewed here). "Joshua the Anchor" sets washes of analog keyboards buzzing against a ten-ton waltz; "The Darwinian Heart of Darkness" recalls early Isis in the planetary bigness of its riffs; "Last Flight of the Dodo Bird" seems aimed at new vistas, with melodic vocals and elastic bass (courtesy of Intronaut's Joe Lester) striating Tambascio's spidery guitar and Donley's totally money drumming. These guys were going places. In other news, we're excited to announce that Graviton (our new side project with Sacha Dunable of Intronaut) has finished recording a full length album. We hope to have it available by the fall, around the same time as the new Intronaut record! While we all wait for Darin to win a lucrative government oil contract so that National Sunday Law might tour and record again, download the The Fifth Ape EP, hold your breath for the Graviton release, and if you're in the LA area, come out to one of their last two shows. It's been a good run, boys. June 3rd @ Relax Bar with Salvador, Of The Horizon, Nameless Lights. NSL is on at 9:55pm. June 7th @ Vacation Vinyl in-store with free Colt 45. 7pm sharp.